Pain is the #1 complaint of soldiers fighting for our country. 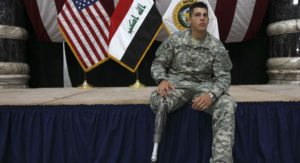 Derek McGinnis, a young military veteran and recipient of the Purple Heart will trace the events that led to his leg amputation, and how a simple nerve block became a lifesaver. Dr. Trip Buckenmaier from the Walter Reed Army Medical Center will share some exciting new methods of controlling pain soon after a warrior is injured.